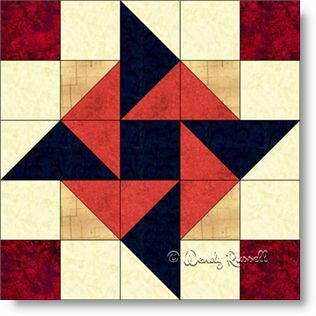 The Midnight Pinwheel quilt block is a five patch block (so named because it is designed on a 5 x 5 grid) containing, squares, half square triangles and flying geese patches. Rather than construct the block as five rows of five patches, I prefer to sew it as an uneven nine patch for the simple reason that I like to work with "chunks" rather than in rows. However, do not let my method sway you. Choose your favourite sewing method. The sample quilts illustrated are both designed on point but look very different. I also chose to use mitred borders on one quilt just to keep the colour blocking going. I would be very interested in seeing your finished design one day!